Sarah, the Store Manager, greeted us with prosecco and a smile and talked us through some new products, as well as some old favourites. 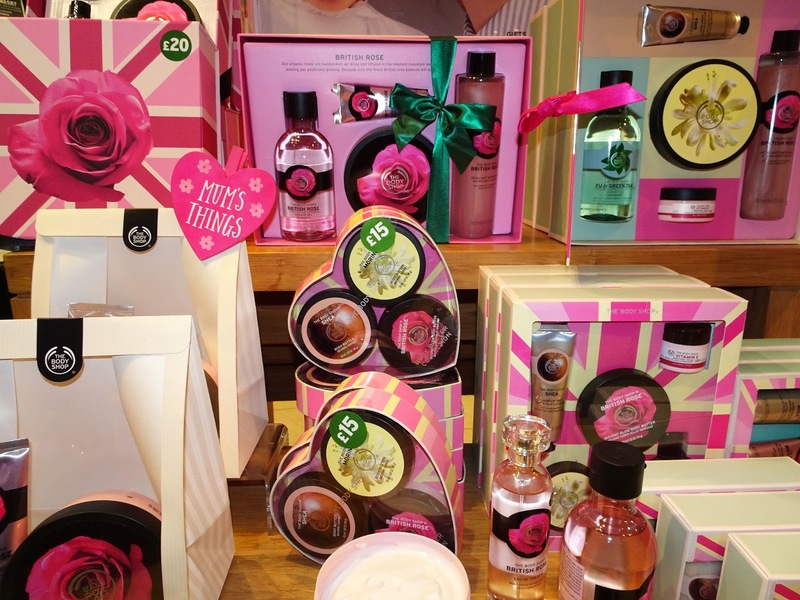 The main scent that seems to be featured in a lot of the tailored gift range for Mother's Day is 'British Rose'. Although they look so pretty, I personally am not a big fan of florals. If you're the same, fear not because The Body Shop always has a backup, and have also recently launched a new white musk scent (which is also vegan!). If that still doesn't tickle your fancy, they always have a number of alternative gift sets, with a range of different scents. One of those is sure to suit you. My personal favourite is strawberry, but moringa is a very close second. One product that immediately took my eye was the liquid peel. 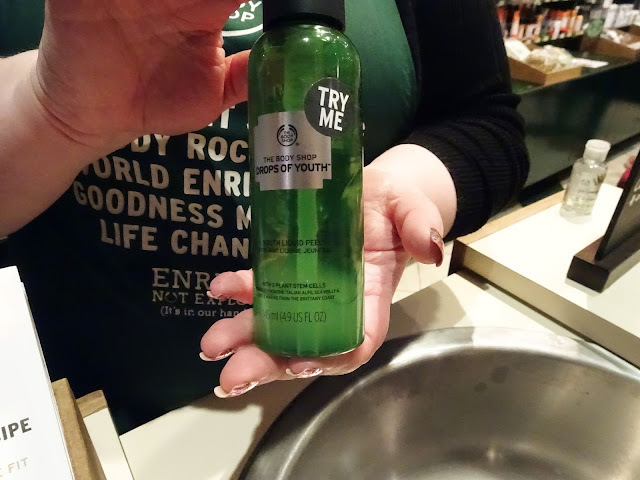 Launched at the end of 2016, The Body Shop have three variations of Liquid Peels. Drops of Youth, Drops of Light, and Vitamin C. All you need for your face is a small blob, around the size of a twenty pence piece. She showed us on the back of her hand, and as she rubbed, little white and gray lumps started appearing! 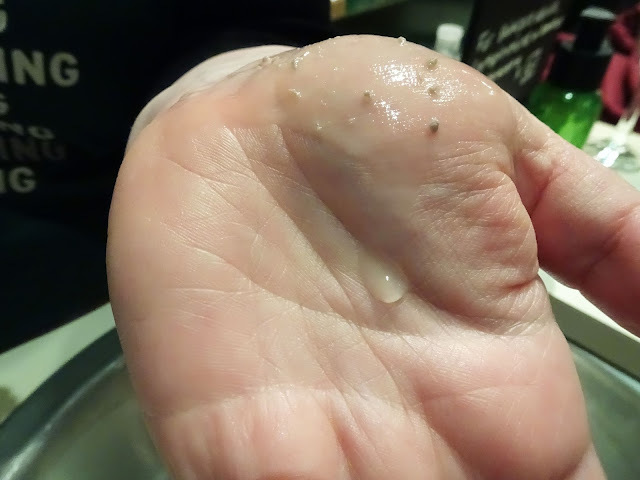 She explained that the liquid peel gently exfoliates and those little lumps were clumps of dead skin and pollutants. Although this absolutely fascinated me, I was a little sceptical. I mean, she was demoing it all night, and there was still skin coming off after four demos. Surely that wouldn't have been good for your skin? Is it really worth stripping so many layers of skin? Skip forward to later that night, and I decided to do a little research. I came across this Reddit post, where someone explained how the product works a little clearer. After seeing the demo, I was really interested, and she was kind enough to give me a sample of each of the three peels. I went home and tried the Vitamin C sample, and I was quite impressed. So impressed that I went out and bought the full-size product when I was in York the following weekend. I plan to actually write about this so I won't go into too much detail until I've tried it for a few solid weeks! British Rose, and various other sets. I didn't even know they did Eau de Toilettes! We were also treated to a variety of smoothies and frozen yoghurts from Yogee. Yogee is an independent cafe in Liverpool City Centre. I chose a Pineapple Paradise smoothie, and oh dear God it tasted so good! Yogee does a range of food, from frozen yoghurts and waffles, to lasagne and full English breakfasts. They're up towards the top of Myrtle Street, so if you're ever at that end of town, I'd definitely recommend grabbing yourself something. Sarah was even kind enough to hold a raffle at the end, and I won a 30ml Oils of Life Serum! As always, I had a ball at The Body Shop. 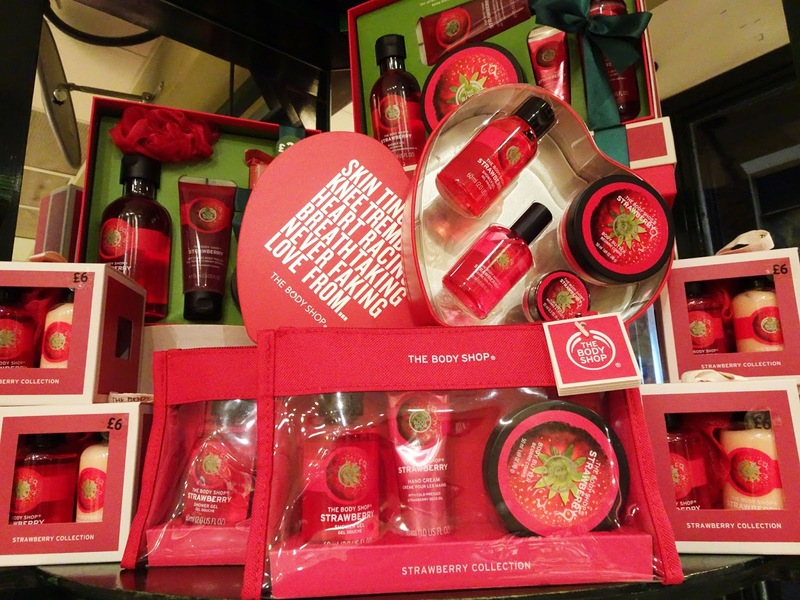 If you want to treat your Mother to a top notch pamper session, The Body Shop always has your back. 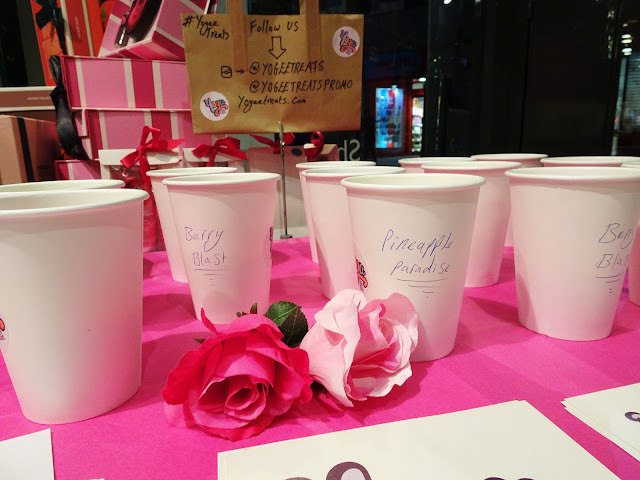 They have so many different products to try that you're bound to find something that your Mum, or any other special lady in your life, loves. 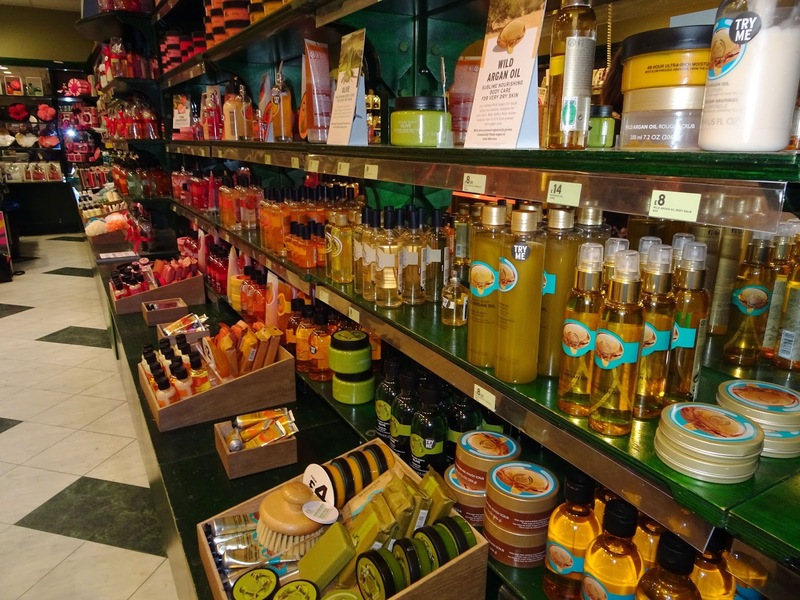 If you liked this, you'll love My Top 3 Vegan Products from The Body Shop. 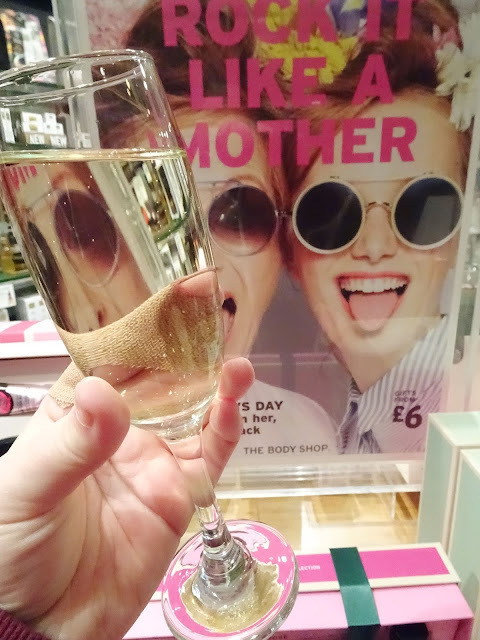 Love The Body Shop blogger events! I'm in love with the new White Musk scent. I can't believe it's been a whole year since the liquid peel came out and I STILL haven't tried it. I've heard nothing but good things, and your photo just goes to show how effective it is!